Its suddenly a little cool down our way and we haven’t even hit winter yet! Don’t despair though, because in our eyes it’s still beach weather. What? We hear you ask …. Yes, we know, you usually spend time on the beach when its 35 degrees plus, but we reckon that if you don’t come down in the cooler months you might just be missing out on a really great holiday. Not only are the below ideas fun for all ages, but they are also FREE. Bike riding is fun and family friendly and its a great way to see our scenic coastline. First things first – what are the advantages of visiting the beach in the cooler months? You won’t have to fight for a spot on the sand – take your pick! All of the activities below are FREE. You’re much less likely to get sunburt – although make sure to use SPF even when its overcast. 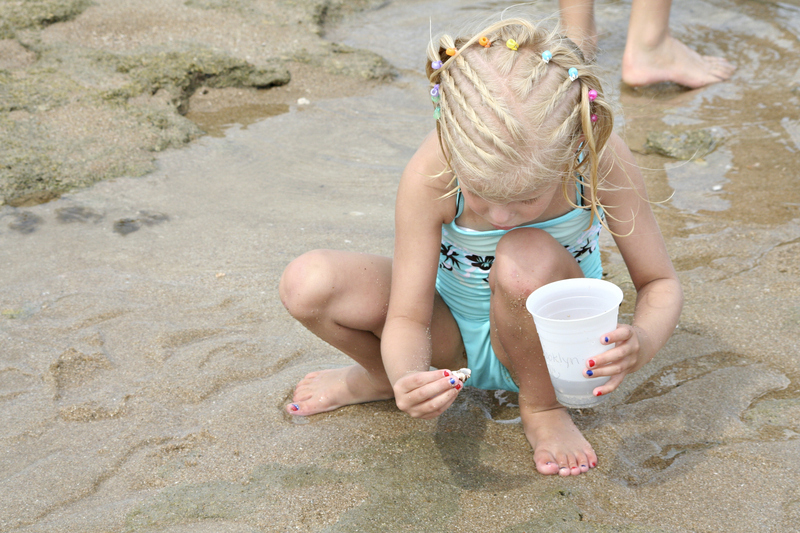 There’s so much to discover on the beach! Kids love to find interesting things, especially in rock pools. Sand art: Test your creative skills and make sand castles or sand sculptures. This one is fun and can be made into a competition – you just need an impartial judge! The only materials required are a bucket and a trowl, there’s plenty of natural decorations to be found lying around. Volleyball, Football, Soccor or Cricket: The best way to warm up is to get moving! You’re not going to feel the cold when you’re running around hitting or catching a ball and the soft sand is the perfect crash mat for those epic catches. Cycling: We are blessed with some fantastic bicycle tracks on the coast …get on your bike and check some out! 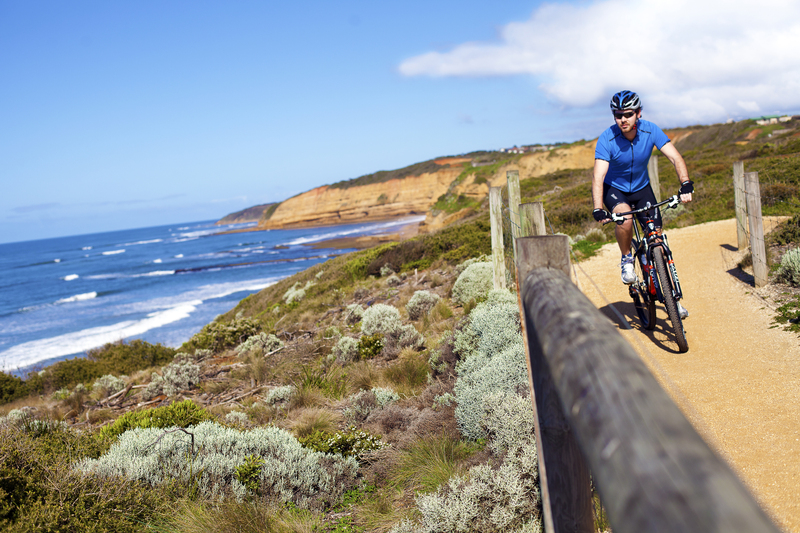 There are tracks for all levels of rider and parts of the Surf Coast Walk is perfect for cycling. Photography: There’s nowhere quite like the great ocean road for spectacular scenery. Get your camera out and take some incredible shots of cliffs, wildlife, beach scenery or your friends and family. Wildlife spotting: Grab a pair of binoculars and head off on a beach safari. 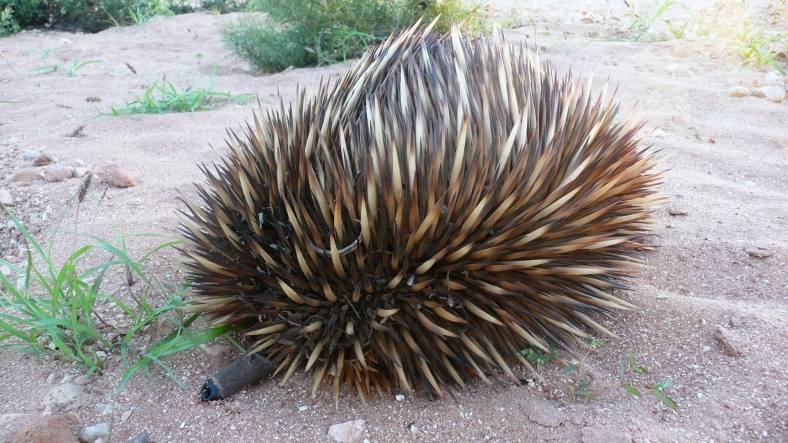 See if you can spot endangered animals like the Hooded Plover or Rufus Bristlebird or some of our more common but equally cute friends such as echidnas and koalas. For a sure fire way to view some wildlife, head on over to the Jirrahlinga Koala Wildlife Sanctuary where you can meet all sorts of furry friends. Head out on a wildlife walk – there’s so many amazing animals to be spotted. Have a picnic. If it’s not swimming weather but it’s not too windy or overly cold a picnic is a great activity. You’re spoilt for scenic spots and if it is a little chilly you can bring some hot chocolate. Fly a kite: There’s no place quite so perfect for kites as the beach. Kites are inexpensive and can even be made at home. Kids and adults alike will love this activity. Play Pictionary: The beach is a perfect canvas for drawing pictures which you can turn into your very own outdoor Pictionary game. Visit the rockpools: Rockpools are often full of interesting wildlife and sea plants. Discover little underwater worlds and identify the sea life. Do nothing. This is probably one of our favourite options! Lie around, read a book, eat great food and RELAX. Are you someone who likes the beach in the cooler months? What do you like to do at the beach when the weather is a little more wintery? ← Australia’s dirtiest beaches exposed!